A cockpit or flight deck is the area, usually near the front of an aircraft, from which a pilot controls the aircraft. Most modern cockpits are enclosed, except on some small aircraft, and cockpits on large airliners are also physically separated from the cabin. It is a place where from which flight is controlled on the ground and in the air. Cockpit as a term for the pilot's compartment in an aircraft first appeared in 1914. From about 1935 cockpit also came to be used informally to refer to the driver's seat of a car, especially a high performance one, and this is official terminology in Formula One. The term is most likely related to the sailing term for the coxswain's station in a Royal Navy ship, and later the location of the ship's rudder controls. Airbus A380 cockpit. 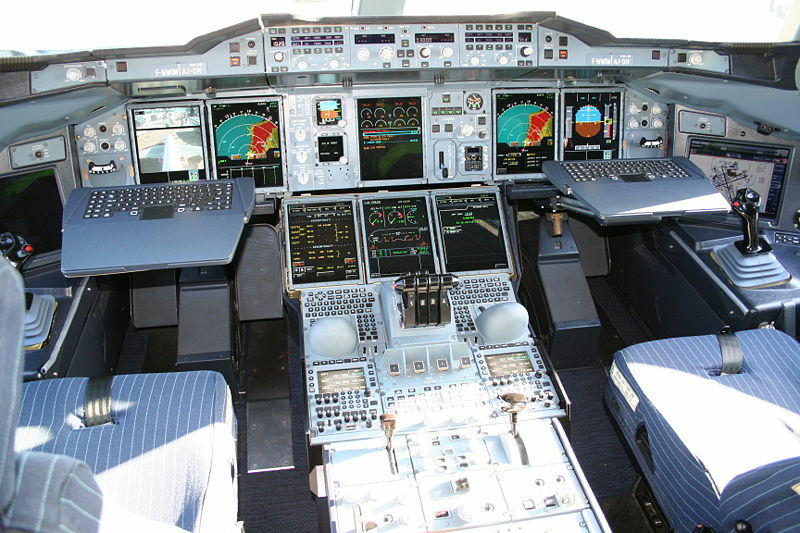 Most Airbus cockpits are computerised glass cockpits featuring fly-by-wire technology. The control column has been replaced with an electronic sidestick. Single-seat glider cockpit, with a forward hinged canopy in the open position. Click on the image for a description of the instrumentation. 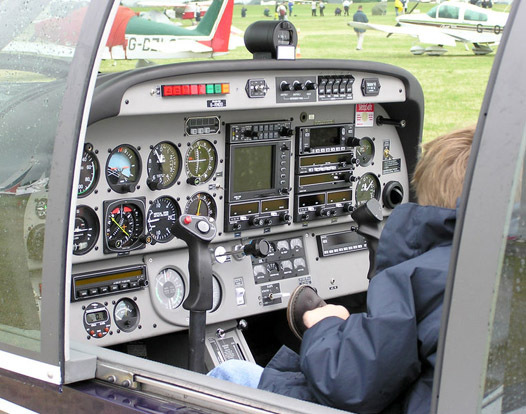 The cockpit of an aircraft contains flight instruments on an instrument panel, and the controls which enable the pilot to fly the aircraft. In most airliners, a door separates the cockpit from the passenger compartment. After the September 11, 2001 terrorist attacks, all major airlines fortified the cockpit against access by hijackers. On an airliner, the cockpit is usually referred to as the flight deck. This term derives from its use by the RAF for the separate, upper platform where the pilot and co-pilot sat in large flying boats. The first airplane with an enclosed cabin appeared in 1913 on Igor Sikorsky's airplane The Grand. However, during the 1920s there were many passenger aircraft in which the crew were open to the air while the passengers sat in a cabin. Military biplanes and the first single-engined fighters and attack aircraft also had open cockpits into the Second World War. Early airplanes with closed cockpits were the 1924 Fokker tri-motor, the 1926 Ford Tri-Motor, the 1927 Lockheed Vega, the Spirit of St. Louis, the 1931 Taylor Cub, German Junkers used as military transports, and the passenger aircraft manufactured by the Douglas and Boeing companies during the mid-1930s. Open-cockpit airplanes were almost extinct by the mid-1950s, with the exception of training planes and crop-dusters. 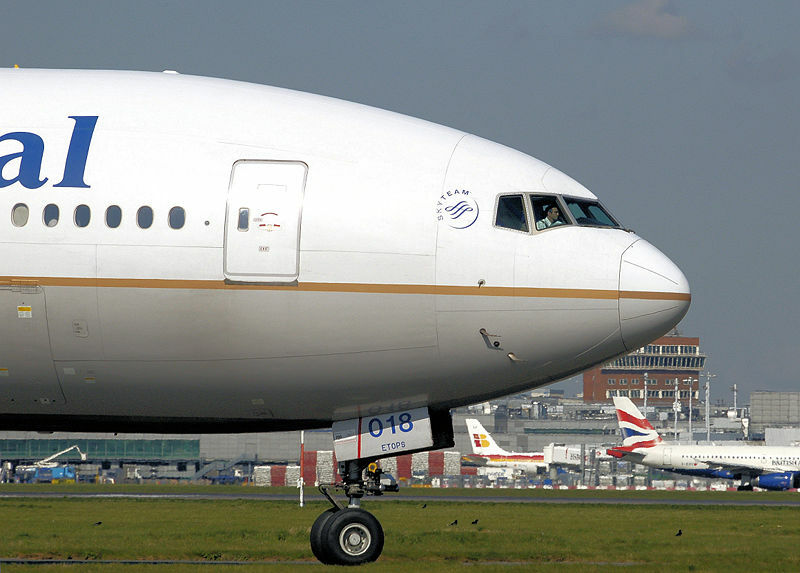 A pilot can be seen on the flight deck of this Continental Airlines Boeing 777-200 as it taxis to the take off point at London Heathrow Airport, England. Cockpit windows may be equipped with a sun shield. Most cockpits have windows which can be opened when the aircraft is on the ground. Nearly all glass windows in large aircraft have a Anti-reflective coating, and an internal heating element to melt ice. Smaller aircraft may be equipped with a transparent aircraft canopy. In most cockpits the pilot's control column or joystick is located centrally (centre stick), although in some military fast jets and in some commercial airliners the pilot uses a side-stick (usually located on the outboard side and/or at the left). The layout of the cockpit, especially in the military fast jet, has undergone standardisation, both within and between aircraft different manufacturers and even different nations. One of the most important developments was the “Basic Six” pattern, later the “Basic T”, developed from 1937 onwards by the Royal Air Force, designed to optimise pilot instrument scanning. Erogonomics and human factors concerns are important in the design of modern cockpits. The layout and function of cockpit displays controls are designed to increase pilot situation awareness without causing information overload. In the past, many cockpits, especially in fighter aircraft, limited the size of the pilots that could fit into them. Now, cockpits are being designed to accommodate from the 1st percentile female physical size and the 99th percentile male size. 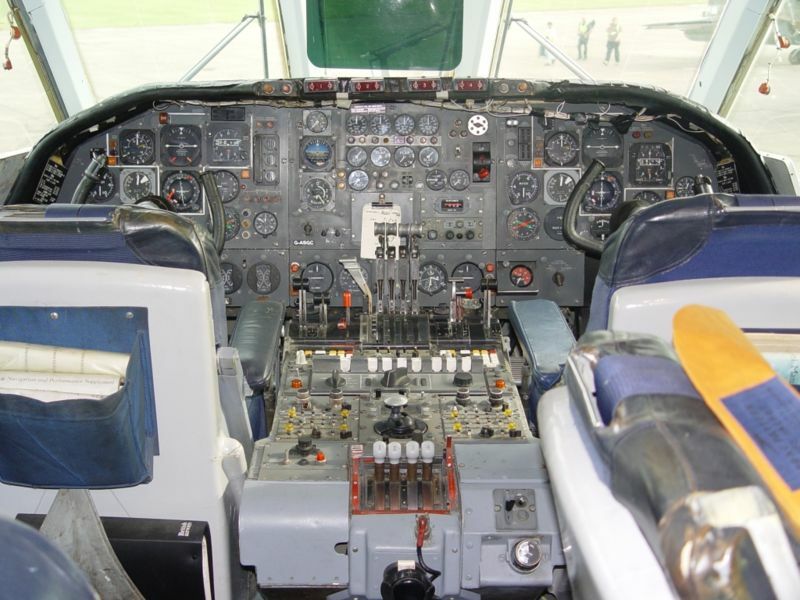 In the design of the cockpit in a military fast jet, the traditional “knobs and dials“ associated with the cockpit are mainly absent. Instrument panels are now almost wholly replaced by electronic displays which are themselves often re-configurable to save space. While some hard-wired dedicated switches must still be used for reasons of integrity and safety, many traditional controls are replaced by multi-function re-configurable controls or so-called “soft keys”. Controls are incorporated onto the stick and throttle to enable the pilot to maintain a head-up and eyes-out position – the so-called Hands On Throttle And Stick or HOTAS concept,. These controls may be then further augmented by new control media such as head pointing with a Helmet Mounted Sighting System or Direct Voice Input (DVI). New advances in auditory displays even allow for Direct Voice Output of aircraft status information and for the spatial localisation of warning sounds for improved monitoring of aircraft systems. A central concept in the design of the cockpit is the Design Eye Position or "DEP". The layout of control panels in modern airliners has become largely unified across the industry. The majority of the systems-related controls (such as electrical, fuel, hydraulics and pressurization) for example, are usually located in the ceiling on an overhead panel. 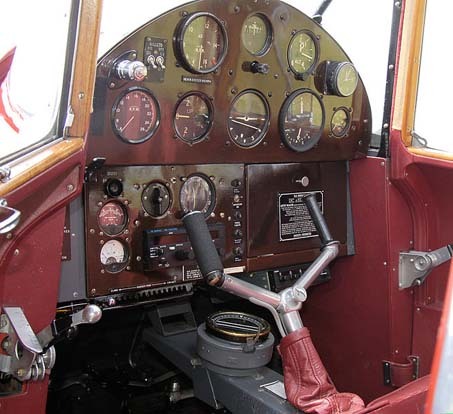 Radios are generally placed on a panel between the pilot's seats known as the pedestal. Automatic flight controls such as the autopilot are usually placed just below the windscreen and above the main instrument panel on the glareshield. USAF and IAF airmen work inside the cockpit of an IAF Ilyushin Il-76. In the modern electronic cockpit, the flight instruments usually regarded as essential are MCP, PFD, ND, EICAS, FMS/CDU and back-up instruments. A Mode Control Panel, usually a long narrow panel located centrally in front of the pilot, may be used to control Heading(HDG), Speed(SPD), Altitude(ALT), Vertical Speed(V/S), Vertical Navigation(VNAV) and Lateral Navigation(LNAV). It may also be used to engage or disengage both the autopilot and the autothrottle. The panel as an area is usually referred to as the "glareshield panel". MCP is a Boeing designation (that has been informally adopted as a generic name for the unit/panel) for a unit that allows for the selection and parameter setting of the different Autoflight functions, the same unit on an Airbus aircraft is referred to as the FCU (Flight Control unit). The Primary Flight Display will usually be located in a prominent position, either centrally or on either side of the cockpit. It will show the current pressure setting for the altimeter (local or standard), target speed and current speed, target altitude and current altitude, vertical speed and the condition of the Instrument Landing System (ILS) (if engaged). It may be pilot selectable to swap with the ND. A Navigation Display, which may be adjacent to the PFD, shows the current route and information on the next waypoint, current wind speed and wind direction. It may be pilot selectable to swap with the PFD. VC-10 (1960s) The Vickers VC10 airliner featured an analog cockpit, with old-style instruments. The Engine Indication and Crew Alerting System (for Boeing) or Electronic Centralized Aircraft Monitor (for Airbus) will allow the pilot to monitor the following information: values for N1, N2 and N3, fuel temperature, fuel flow, the electrical system, cockpit or cabin temperature and pressure, control surfaces and so on. The pilot may select display of information by means of button press. The Flight Management System/Control Unit may be used by the pilot to enter and check for the following information: Flight Plan, Speed Control, Navigation Control, and so on. In a less prominent part of the cockpit, in case of failure of the other instruments, there will be a set of back-up instruments, showing basic flight information such as Speed, Altitude, Heading, and aircraft attitude. In the U.S. the Federal Aviation Administration (FAA) and the National Aeronautics and Space Administration (NASA) have researched the ergonomic aspects of cockpit design and have conducted investigations of airline industry accidents. Cockpit design disciplines include Cognitive Science, Neuroscience, Human Computer Interaction, Human Factors Engineering, Anthropometry and Ergonomics. Aircraft designs have adopted the fully digital “glass cockpit.” In such designs, instruments and gauges, including navigational map displays, use a user interface markup language known as ARINC 661. This standard defines the interface between an independent cockpit display system, generally produced by a single manufacturer, and the user applications which need to be supported by it, by means of displays and controls, often made by different manufacturers. The separation between the overall display system, and the applications driving it, allows for considerable specialization and independence.